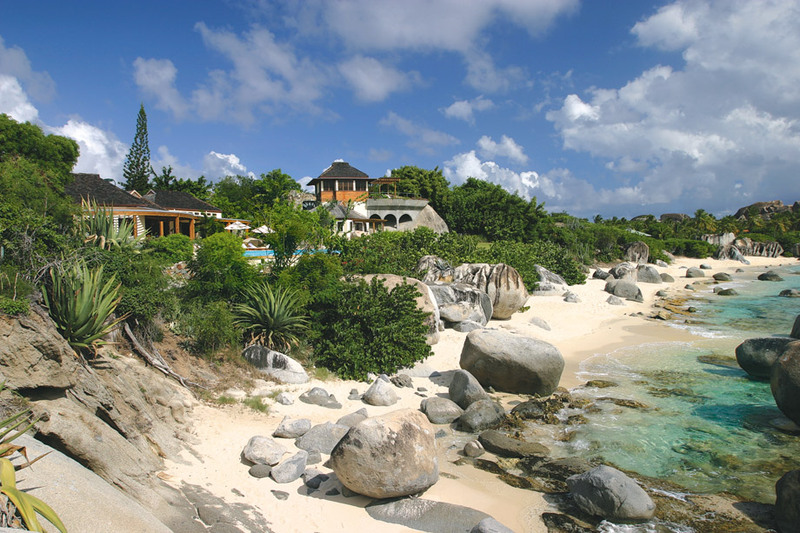 Virgin Gorda is the perfect beach retreat for many island sun lovers and connoisseurs. Although just a scenic 30-minute ferry ride away from larger and busier Tortola, sister island Virgin Gorda is less developed and a lot slower-paced, and a very popular anchorage for charter yachts and power boats, big and small. Its spectacular white sand beaches are edged by turquoise seas and wondrous coral reefs for snorkeling and diving. We have several luxury villas right on or within a short walk of tranquil Mahoe Bay! Especially memorable are The Baths, a famous and much-photographed locale where immense boulders are scattered along stunning beaches, creating magical beachfront and underwater grottos - a truly exotic landscape that you can explore. The Baths are not all that tiny, idyllic Virgin Gorda has to offer. McLaughlin Anderson Luxury Villas has an amazing selection of vacation rental properties on Virgin Gorda, many of these fronting right on a dreamy white-sand beach! Once on Virgin Gorda, visitors discover striking differences in topography, flora, and even climate. Spanish Town (Virgin Gorda's only town!) is the shopping and dining center; the Copper Mine, over 400 years old, remains a popular stop in the southeast. Imposing cactus plants pepper boulder-strewn landscapes just outside of Spanish Town on the way to the white sand beaches and snorkeling reefs at Nail Bay and Mahoe Bay. Hikers may decide to take on Gorda Peak near the center of the island, a rugged trail that leads up to 1,359 feet above sea level. A 360-degree view of sapphire blue waters and verdant hills and valleys is the reward to the most intrepid! And a jaunt to the North Sound area and Leverick Bay lends itself to diving, snorkeling and boating pleasures. Saba Rock and the Bitter End Yacht Club are popular pit stops for both sailors and island visitors. The South Sound area has its own charms, particularly vibrant coral reefs, privacy and lots of greenery. But Virgin Gorda's real allure lies in its relaxed and tranquil ambience - you can kick back at your hillside or beach villa and just enjoy a simple island vacation away from the hustle and bustle, surrounded by sun, sand and sea plus family and friends; there's no pressure here at all to "see everything" and "do everything". British Virgin Islanders are friendly and welcoming, and as in many small communities, life on Virgin Gorda is more tranquil and simpler. A Virgin Gorda vacation is the perfect way to re-connect and rejuvenate. It's not hard to find your way around or get local knowledge - on this little island, everybody knows everything - so stop in the village to chat. Greet the smiling Virgin Gorda folks with a "Good Morning" or "Good Afternoon" and have an interesting conversation! Virgin Gorda can be reached via scheduled ferries from St. Thomas via Tortola, or by small aircraft flights from San Juan or St. Thomas... and it's well worth the trip! BRING PROOF of YOUR CITIZENSHIP - To re-enter the United States, all travelers - even children - must have a valid passport (or passport card if traveling by sea). Immigration - U.S. Passports or Passport Cards (sea only) required; visas may be required from other destinations. Consult your national immigration office. Please note that smoking in public spaces is banned according to a law passed by the Legislative Council. This includes bars, restaurants, nightclubs, airports, offices and arenas, and within 50 feet of any public area. Keep this in mind as you enjoy your stay in the British Virgin Islands! We highly recommend travel insurance! Please see your travel agent or your provider of choice. Need options? We suggest sites like TravelInsuranceReview.net for a tutorial and comparisons of top travel insurance companies online. Virgin Gorda is a preferred vacation destination because of its relative low-key profile; however, it is not difficult to obtain the service of a specialist when you need one! Our villa guests have many needs, and we are pleased to offer our suggestions here. Virgin Gorda Cellular Phones Rentals & Service - Guests may purchase prepaid CCT Boatphone SIM cards (GSM cellular phone required) or prepaid cards at CCT Boatphone. Pre-registration is highly recommended. While many US phones work in the BVI now, roaming charges often will apply to all calls. Groceries/Provisioning - Bobby's Marketplace, Tortola; (For deliveries to Virgin Gorda, Anegada and Jost Van Dyke, please add a $25.00 fee). For guests staying at our Leverick Bay/Mahoe Bay villas, our island manager will gladly provide provisioning services at the cost of groceries, plus a 25% service charge. Email your list to our villa concierge. Custom provisioning service is also available at Nail Bay villas; please inquire. Virgin Gorda Nanny Care - Tropical Nannies is a personalized baby-sitting service catering to your in-villa childcare needs on Virgin Gorda in the British Virgin Islands. Virgin Gorda is known for shimmering white sands and sparkling waters just right for undersea adventures. Colorful flora punctuate landscapes around your villa and along the quaint roadways. One of the best-kept secrets about this island jewel is its many talented chefs! Imagine lolling about as if in a dream, while your own chef prepares a gourmet feast for the eyes and the palate at your villa. If you are celebrating a special occasion, your chef will enhance the memory of your island vacation with delicious menus and exceptional service. Pre-stock your villa in advance of your arrival so that you can relax on arrival! We recommend Bobby's Marketplace. For guests staying at our Leverick Bay/Mahoe Bay villas, our island manager will gladly provide provisioning services at the cost of groceries, plus a 25% service charge. Email your list to our villa concierge. Custom provisioning service is also available at Nail Bay villas; please inquire. Make your Virgin Gorda villa vacation extra special, with the added pleasure of a massage, manicure, pedicure, facial, or the attentions of a skilled hairstylist. Also enjoy European treatments, waxing, and aromatherapy by appointment. Service availability varies by location; advance reservations are suggested. Leave your Virgin Gorda villa for a day and take the plunge that refreshes, no matter what your skill level. There is nothing more tempting than the crystal-clear aquamarine waters of Virgin Gorda. Diving experts will lead you through a lineup that sounds like a real cast of characters: The Invisibles, Wall to Wall, The Chimney, The Flintstones, Seal Dogs... each site unique and wondrous. Snorkelers may enjoy the fascinating yet serene Baths, or take on Devil's Bay and win! Powerboat rentals and fishing expeditions abound for those who yearn for adventure on the water as well as below. Our concierge will assist you in planning the perfect excursion in Virgin Gorda. Bareboat rentals or crewed charters available. Virgin Gorda is known for its easy pace and idyllic tranquility, with just the right variety of activities to flavor your villa vacation. Calming breezes and cool waters washing over pristine sandy beaches are the obvious choice, but did you know that Virgin Gorda is home to a famed National Park hiking trail (Gorda Peak)? Or that it's possible to swim with dolphins on a day trip to sister island Tortola? Play tennis, enjoy music and sailing exhibitions and more throughout the year in the British Virgin Islands... and return to the serenity of your Virgin Gorda villa to share the memories with each other. Dolphin Discovery, Tortola - "Swim with the Dolphins!" Get closer to these intelligent and amazing creatures and give yourself the Experience of a Lifetime! Gorda Peak hiking trail - is the highest point on Virgin Gorda and is one of the highest in the Virgin Islands exceeded only by mountains on Tortola and St. Thomas. The Virgin Gorda Baths - Gigantic granite boulders and half submerged rocks line the southern seashore of Virgin Gorda, creating grottos, tunnels, and arches - swim, snorkel, and explore. BVI Festival & other Events (Roadtown, East End/Long Look, Tortola) - Calendar updated seasonally. On Virgin Gorda, Easter Festival events take place on the 4 days before Lent in the Spanish Town area. BVI Music Fest (Tortola) - "Where the Sound of Music Meets the Sounds of Nature". International and regional stars in a grand melting pot of music. BVI Spring Regatta (Tortola) - Since 1972; one of the Caribbean's premier annual racing events. Caribbean Arts & Crafts Festival, Beef Island Tortola - Trellis Bay; life and culture through the universal activity of transforming natural materials into significant creations. Air charters also available; custom and medical air travel services. Virgin Gorda Internet Access - Leverick Bay's "Internet Shop" is open 24 hours a day. Cash self service. Down from the Leverick Bay Reception Office (284-495-7421). "The Business Center" is at the Virgin Gorda Yacht Harbour in the Valley, offering mail, phone, fax and Wi-Fi access (284-495-5500). Virgin Gorda Wedding & Photography Services are also available; please inquire.